On Tuesday this week, after nearly three hours of deliberation by a nine-member jury, an eight to one guilty verdict was returned at about 3: 30 p.m. 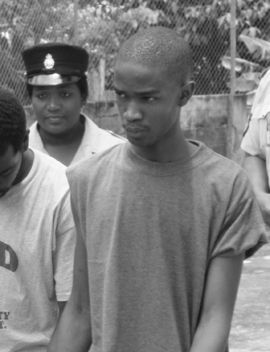 The lanky lad was found guilty of shooting Jerani Peters, 20, also of Paulâs Avenue, on JâOuvert morning, July 9, 2007. When Peters took the witness dock, he told the court that he was dancing to the side of a truck when he saw Belle standing about 30 feet away, in the vicinity of the Old Intermediate High School. The 20- year-old said he noticed Belle wearing a black vest, a pair of short jeans and a wig on his head. He added that he did not pay any attention to Belle and continued dancing. Moments later, Peters said he saw the convicted man about 10 feet away reaching into his waist. Peters recounted: âI saw when he pulled a black gun from his waist and pointed it in my direction, so I tried to run through the crowd.â While trying to seek refuge, Peters was struck in right side of his back. He was rushed to the Milton Cato Memorial Hospital and released a week later, after receiving treatment. However, Peters said he didnât know the reason behind why he was shot as he and the defendant were friends since childhood. Representing Belle in the matter, Counsel Arthur Williams said that Peters never mentioned anything about a wig to the police. Continuing his cross-examination, Williams asked Peters how thick was the crowd and Peters replied that there was a large crowd, but there were not many people to the side of the band or anything that could have obscured his view. âDo you have bionic eyes?â asked Williams, and with a slight chuckle, Peters replied: âI ainât no Bionic man. âI am putting it to you that you donât know who shot you. Is Anancy story you telling,â Williams continued. Peters stood his ground and reiterated that it was the defendant who shot him. Another prosecution witness, Nakita Simmons, told the court that he and his friend (Jerani) were all in the band having a great time when he spotted Belle in the same area where Peters saw him standing. He also corroborated Petersâ evidence and said that he saw Belle pull out the firearm and fire a shot. Taking the witness stand on the advice of his attorney, Belle took the witness stand. He denied ever being in Kingstown that day and emphasised that he did not shoot the complainant. Belle said he was in the âBom-Bomâ area in Cane Hall. Bell said that he was hiding out in that area since April 2007, when he was shot in the back of his head. The only time he mentioned coming to town was on August 4, 2007, when a raid was conducted at the house in Cane Hall, which he occupied at the time. Belle also said that he and the Peters were friends and that he never identified a gun to the police. However, the evidence of investigation officer, Corporal Elmore Alexander, proved different. According to Alexander, Belle admitted to shooting Peters with the same black gun that had been identified earlier. In a statement which Belle gave to the police, he said: âMe and Jerani had get in ah ting from long time and I meet him JâOuvert morning and shoot him with the gun yo have in yo handâ. According to the statement, Belle also disclosed that the magazine fell from the gun when he fled the scene that morning. Belle is currently serving a six-year prison sentence on gun and ammunition charges stemming from the same raid, which took place in Cane Hall on August 6, 2007.